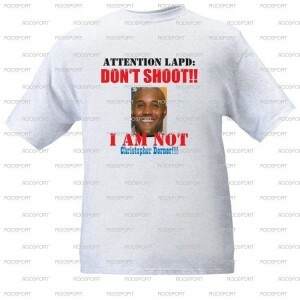 After the LAPD shot at three innocent individuals in the frenzied manhunt for Christopher Dorner, T-shirts and bumper stickers began appearing around Los Angeles and online -- equal parts commentary, dark comedy and serious message: "Don't Shoot, Not Dorner!" has become a fledgling meme. In the image to garner the most viral attention to date, a muscular black man buying groceries is featured wearing a grey T-shirt inscribed with the words "Not Chris Dorner, Please Do Not Shoot." In another image, a pickup truck displays a handwritten sign reading, "Don't Shoot! Not Dorner, Thank You." It's a direct jab at the LAPD after two pickup trucks similar to Dorner's vehicle were shot at by police while innocent passengers were inside. Printed bumper stickers and shirts with the same message are now available for sale on eBay. The lawyer of a man driving one of these pickups told the Los Angeles Times, "I don't want to use the word 'buffoonery' but it really is unbridled police lawlessness ... These people need training and they need restraint." The emergence of Dorner merchandise is a grim reflection on the LAPD's alleged shoot first, question later attitude, especially since issues of police brutality are at the very center of the Dorner saga. Beyond this, the swiftness with which "Don't Shoot!" items have gone on sale illustrate another troubling fact that hardly bears reiterating: Whenever there's a buck to be made, whatever the circumstance, someone is going to try to make it.